A moral allegory in which beasts, and occasionally plants, act and speak like human beings. It is distinct from the beast-tale, in which beasts act like men, but in which there is no moral. In the ancient world two nations only, the Indians and the Greeks, are known to have had any considerable number of fables. In the Bible, however, there is the fable of the trees choosing their king (Judges xi. 8-15), told by Jotham to persuade the Israelites not to elect Abimelech as their king. This is a genuine fable which finds no parallel in either Greece or India. Besides this, Jehoash of Israel answers Amaziah of Judah, when requesting an alliance, in an allegorical response which resembles a fable (II Kings xiv. 9). 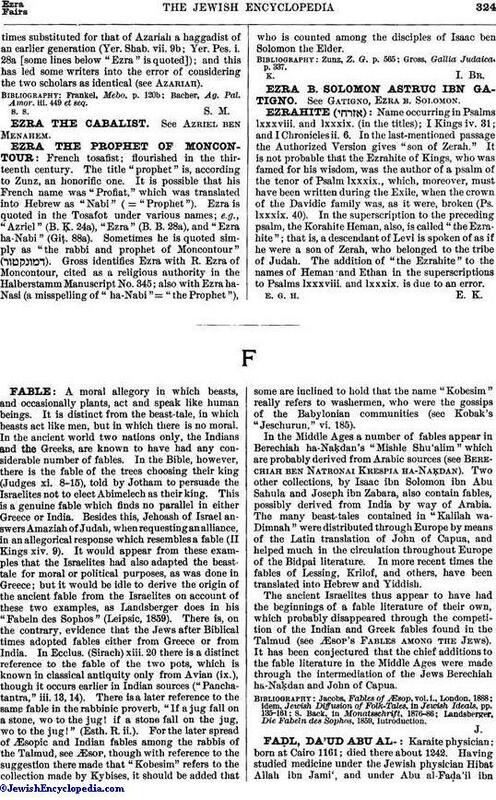 It would appear from these examples that the Israelites had also adapted the beasttale for moral or political purposes, as was done in Greece; but it would be idle to derive the origin of the ancient fable from the Israelites on account of these two examples, as Landsberger does in his "Fabeln des Sophos" (Leipsic, 1859). There is, on the contrary, evidence that the Jews after Biblical times adopted fables either from Greece or from India. In Ecclus. (Sirach) xiii. 20 there is a distinct reference to the fable of the two pots, which is known in classical antiquity only from Avian (ix. ), though it occurs earlier in Indian sources ("Panchatantra," iii. 13, 14). There is a later reference to the same fable in the rabbinic proverb, "If a jug fall on a stone, wo to the jug! if a stone fall on the jug, wo to the jug!" (Esth. R. ii.). For the later spread of Æsopic and Indian fables among the rabbis of the Talmud, see ÆSOP, though with reference to the suggestion there made that "Kobesim" refers to the collection made by Kybises, it should be added that some are inclined to hold that the name "Kobesim" really refers to washermen, who were the gossips of the Babylonian communities (see Kobak's "Jeschurun," vi. 185). In the Middle Ages a number of fables appear in Berechiah ha-Naḳdan's "Mishle Shu'alim" which are probably derived from Arabic sources (see Berechiah ben Natronai Krespia ha-NaḲdan). Two other collections, by Isaac ibn Solomon ibn Abu Sahula and Joseph ibn Zabara, also contain fables, possibly derived from India by way of Arabia. The many beast-tales contained in "Kalilah wa-Dimnah" were distributed through Europe by means of the Latin translation of John of Capua, and helped much in the circulation throughout Europe of the Bidpai literature. In more recent times the fables of Lessing, Krilof, and others, have been translated into Hebrew and Yiddish. The ancient Israelites thus appear to have had the beginnings of a fable literature of their own, which probably disappeared through the competition of the Indian and Greek fables found in the Talmud (see Æsop's Fables among the Jews). It has been conjectured that the chief additions to the fable literature in the Middle Ages were made through the intermediation of the Jews Berechiah ha-Naḳdan and John of Capua. Landsberger, Die Fabeln des Sophos, 1859, Introduction.